The Slynx, which I picked up on a whim, is also the first book I’ve ever read from New York Review Books’ immaculately designed collection. It will definitely not be the last. I knew nothing about this book, but the cover copy referenced both Pale Fire and A Clockwork Orange and the setting sounded kind of like Roadside Picnic, so I was in. I could not have been happier with this decision. The Slynx delighted, surprised, and astounded me at every turn of the page. The Anthony Burgess comparison is valid. Before the story starts there’s a brief glossary detailing a few of the new terms Tolstaya will use throughout the rest of the story. These words are simple, evocative, and soon become second nature to the reader. The rest of the vernacular spoken by the unfortunate denizens of future Moscow, though, is a quarrelsome, bouncy sort of speech, at once completely engaging, hilarious, but also monstrous when you think about it for more than five minutes. There’s a lot of talk of ridiculous games and violent occurences, but the engaging narration staves off what could have been a The Road-style exercise in murder-wallowing. Tolstaya’s use of language recallsthe best of Vonnegut, especially Cat’s Cradle, with its internal consistency that doesn’t put the reader off for not knowing exactly what’s going on at all times. Benedikt is a fun character to follow around. He’s a braggart who’s deeply stupid, but also very endearing. As the story progresses, Benedikt’s true love of reading, first at his work being a scribe, later as an agent of the government confiscating books, becomes almost an addiction, much more important than the various women he lusts after, or the family he marries into. Every reader will see a bit of themselves in Benedikt, hoarding away volumes with zealous tsundoku abandon like that episode of The Twilight Zone. It’s endearing the way that he reads every single bit of pre-Blast literature with the same abandon and reverence, be it a nursery rhyme or one of the many works of Russian poetry found throughout the book. That reliance on pre-Apocalypse poetry was really the only part of the book I didn’t love, but I realize that this is more of a personal failing than anything. I had the exact same problem with Roberto Bolaño’s The Savage Detectives, references going way over my head. At least in The Slynx there’s an appendix telling you who wrote each poem, if you want to track it down, and there’s the nice bonus that few of the characters in the story would know any more than I do. I also feel like Tolstaya’s less interested in doing metafictional jokes with her references than Bolaño is, but again I don’t really know for sure. I really like the lo-fi way Tolstaya increases the weirdness of the setting, chapter by chapter. First it seems like the only domesticated animal people have anymore is mice, which serve as primary foodstuff and currency. But then you start finding out about peoples’ Consequences, their mutations, and you have to add that to your mental image of the scene, that it looks like Mad Max meets Xavier’s School for Gifted Youngsters. Then you discover that the Degenerators people use as beast of burden are basically just men in horse costumes, and that people who survived the initial Blast haven’t aged anymore, and so on, and so on. Tolstaya combines this absolute mastery of her setting with an absolute defiance of “regular” heroic narratives of the Joseph Campbell/Hero With a Thousand Faces school. The story is full of twists and turns, and I’ll go on record as saying I didn’t see many of them coming at all. Maybe Campbellian monomyth never really caught on in Russia in the mid-90s? 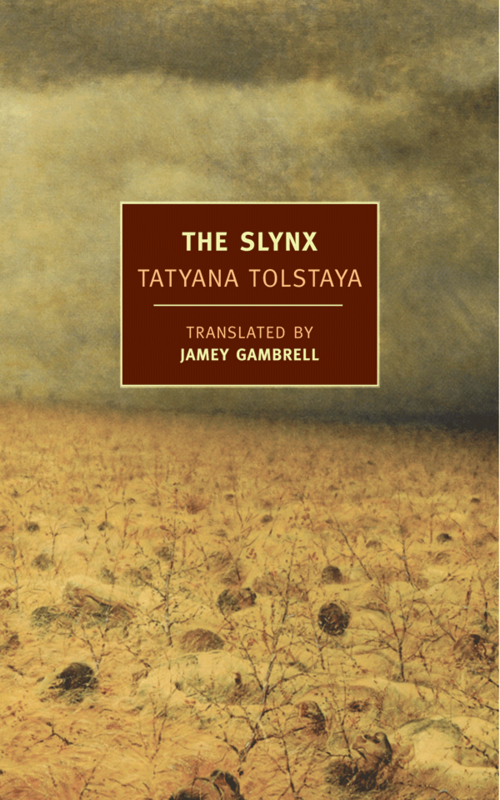 The Slynx is a fabulous book, a must for fans of the above-mentioned authors, Bradbury’s Fahrenheit 451, or Tarkovsky’s film Stalker, the video games based on Stalker, or even the Fallout video games. Basically, if you’re looking for a good time in the post-apocalypse and you’re getting tired of standard narrative conventions, seek this one out.